Margaret Pearl Duvall was born in Morgansfield, Kentucky on April 3rd, 1930. She was the youngest of twelve children born to Pearlie Agnes (McBride) Duvall and John William Duvall. Raised in Kentucky and Indiana, Margaret Pearl had that down-to-earth, practical common sense that comes from people of the land. Having so many older brothers and sisters also shaped her sensitivity to community living and to taking ownership of one’s own distinctive person. 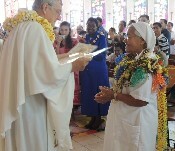 Margaret Pearl entered the Marist Missionary Sisters in July, 1948. She made her first vows on February 2nd 1951 in Bedford, Massachusetts. 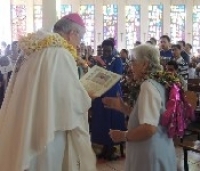 She was known for many years as Sr Mary Georgiana. After profession she was sent to cooking school and was to use the gift of being an excellent cook and house manager in many subsequent appointments – at the Marist Seminary in Staten Island (1951-51), at the Marist Fathers’ Novitiate in Rhinebeck New York (1963-70), and in our own communities in Hawaii, Framingham, Lowell and Newton Street. Even in her later years at St Mary’s apartments (2001-2010), she loved to invite Sisters for a home cooked meal with all the trimmings. 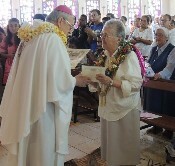 Assigned to the Marist parish, “Star of the Sea”, in Honolulu Hawaii (1953-57), Sister was involved in catechetical work. 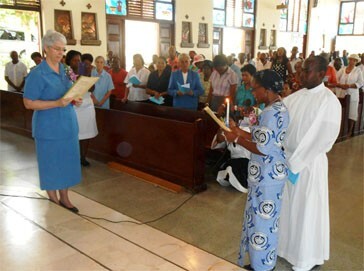 After her years in Rhinebeck, she studied for a Certificate in Religious Education in Ontario, Canada, and then volunteered for the mission in Peru in 1972. Her three years in the Amazon jungle would become a precious experience with all of its challenges and primitive living conditions, dictated by the remote jungle environment. Lung problems began to plague her and when she bled from the lungs she went to Lima, underwent surgery, and returned to Lexington Massachusetts for health reasons at the end of 1975. Noted for her good sense and direct insights, she was often asked to be in leadership on local and Regional levels. Sr Margaret Pearl could always be counted on to raise the unspoken question or the uncomfortable issue at Assemblies or Chapters. This gift helped us to remain honest. Perhaps it was also this gift that led her to train for a ministry in Spiritual Direction at the Cambridge Center in 1983. 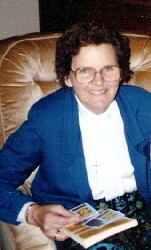 Sister Margaret Pearl became a much sought after spiritual director and established a large clientele. She worked first from her home at the Annex in Waltham, and later from St Mary’s Apartments. 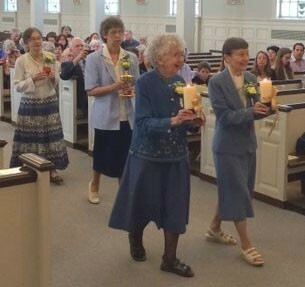 For many years she spent part of every month giving retreats or direction at the Mercy Retreat Center in Madison, Connecticut. 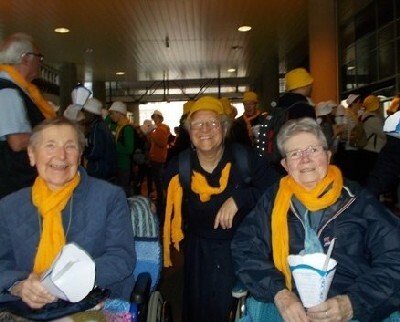 She was happy when she was able to travel to Peru to give a retreat to our Sisters there. Many of us benefitted from her wisdom and gentle guidance. Over the years Sister would travel to Indiana for the month of July each summer to assist her family. Being the youngest meant that there was always someone to accompany and she was very dedicated to her family. She often returned with fruit to can for home-made jam to be given to each community at Thanksgiving. Her creativity extended to flower arrangements, home-made cards and playing the guitar. Since 1975 she had been under the care of specialists for her lung condition. She had great difficulty breathing and frequent infections in 2007, again in 2009 and, finally in April 2010 she had an incurable infection which gradually led to her death on September 6th at Maristhill Nursing Home in Waltham. A woman of creative talents, home-making skills and a down to earth humanity, Sr Margaret Pearl was further molded by the Divine Potter in the fire of suffering. All of this enabled her to lead others in being honest human beings, unafraid of life’s challenges, and urged to search and find God in all that happens. Farewell, Margaret Pearl, and thank you for being you and challenging us to be our finest selves.